ACT QUICKLY AGAINST PERPETRATORS OF VIOLENCE. 23 Mar ACT QUICKLY AGAINST PERPETRATORS OF VIOLENCE. Malaysians have just participated in a #Solidarity4Peace march to send the message that violence, hate speech, extremism have no place in Malaysia and in the world. Today, at the March all Malaysians have pledged our commitment to secure peace above all differences and to continue in our efforts to build a culture of peace. However, just yesterday, seven students who participated at a silent and peaceful protest against the RM2.6b stolen from 1MDB, they were violently manhandled by pro-Najib supporters. They were harassed, threatened, pushed, slapped, had racist remarks hurled at them and even brutally choked one of the students. The student could have been killed if not for the intervention of the police on duty. The police, to date, has not acted against the perpetrators. Instead, the students were hauled up to the police station for investigation while the perpetrators are still free to roam around. 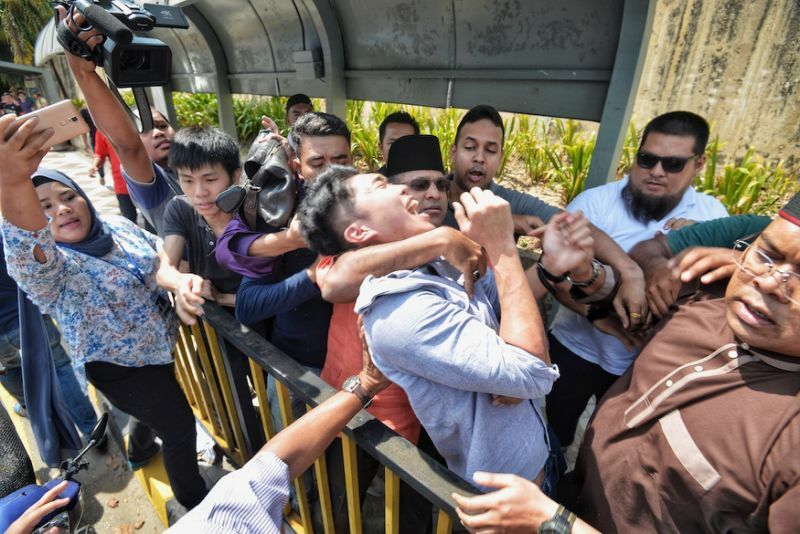 The acts of violence were also meted against two journalists, where they too were threatened for their reporting of the violent incident at Universiti Malaya. Such acts of violence cannot be condoned and can only be condemned. The police must act now. Arrest the perpetrators and jail them, if they are found guilty. Just weeks ago, the Inspector-general of police Mohamad Fuzi Harun has alleged that the organisers of the Women’s Day March had not given due notice for the gathering within the stipulated 10 days, when in fact they did. As a result, the organisers were harassed and hauled up for unnecessary questioning. The failure of the police to act swiftly and fairly has sent a wrong message, i.e., that the police condones violence by gangsters and hooligans and will selectively haul up protestors, especially from the civil society and journalists. The Minister of Home Affairs must take responsibility. In order to protect the image of the police, they have to act now to arrest the perpetrators and deal with the case swiftly and justly. Let us not forget. The Peace March embodies our shared aspiration to end all forms of violence and to safeguard the human rights of all people. Let us not forsake what we have achieve at the Peace March today as true peace requires standing up for human rights for all.